Today: Mint is ready to go to work for you -- bringing its fresh, lively flavor to dishes and drinks all week long. Long ago, to welcome guests, mint leaves might be strewn on the floor or rubbed on the dining table. Mint is the herb of hospitality, although nowadays, your guests would probably prefer a mint julep to a minty floor treatment. Unlike the controversial cilantro, mint is universal; it's ready to perk up everything from dinner to drinks to breakfast. Mint belongs to a big family with a number of other aromatic herbs, including basil, rosemary, sage, thyme, and shiso. 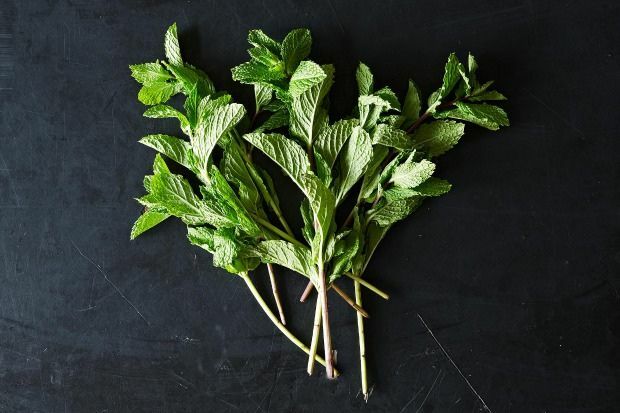 At the grocery store, the mint you’re most likely to find is spearmint; head to a farmers market and you'll see the familiar peppermint, along with pineapple mint, grapefruit mint, chocolate mint, and many others (mint interbreeds really easily, so the possible varieties are seemingly endless). More: Not sure where the nearest farmers market is? Find one on Real Time Farms. Like other fresh herbs, look for vibrantly green bunches of mint -- pass on any that are yellowing or wilty. Store mint just like you would cilantro -- in a jar with water, and loosely covered with a plastic bag in the fridge. If you're going to be using your mint in a cocktail, heed the sage advice of Harold McGee: mint stores its aromatic compounds in the bottom surface of its leaves, so the best way to release the sweet minty flavor is to add a few leaves (1) to your glass and gently muddle. Chopping or aggressively crushing the leaves will release chlorophyll, which means you're more likely to end up with a bitter, grassy-flavored drink. Mint’s bright flavor seems perfect for spring vegetables like asparagus, peas, radishes, and fennel -- but it works just as well with summer favorites and autumn staples like zucchini, summer squash, beets, and potatoes. It plays well with fruit too: try it with melon, peaches, plums, or blood oranges. For a classic, pair it with lamb, or use it with pork, beef, or chicken as well. The lists go on: start cooking pestos, pastas, dips, spreads, and dressings galore. Mint also happens to sing in tea and limeade, and whatever you do, don't stop there -- we've got (plenty of) ideas for the whole week. I have a couple of mint plants, and I use them all the time. I use Mint in cooking stews, stuffed cabbage, salads, and I dry the left over mint leaves for the winter usage. Has anyone used chocolate mint? I have a chocolate mint plant growing in my backyard, and while it could be a psychological thing, I really think it tastes a bit richer! Any suggestions for use? 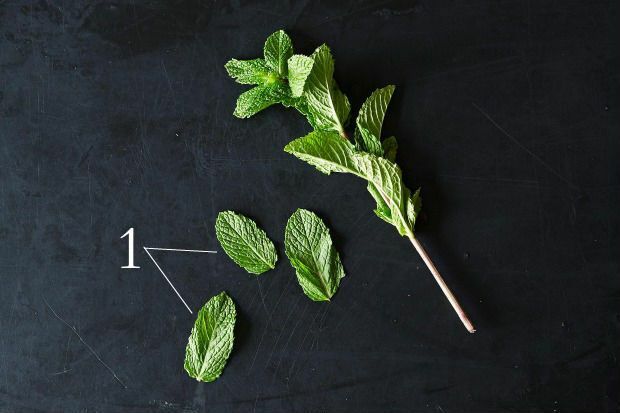 One of my favorite uses for mint is one of the most simple: when I gave up chewing gum, I started chewing on my garden peppermint and spearmint (sometimes I toss in a knob of ginger, too). 1000X better!